If you like the ever-so-delicious spinach artichoke dip, you’re going to LOVE this. 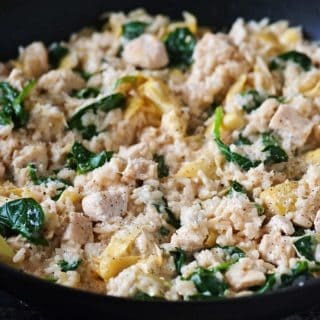 One Pan Spinach Artichoke Chicken and Rice has all the flavor of the dip wrapped up in a filling dinner and made in a single pan! I’m totally off the topic of food today, but I need to have a musical theater geek out moment. Have you heard of the Broadway show, Hamilton? I just discovered it a few weeks ago and I’m slightly obsessed. It follows the story of Alexander Hamilton and the music is pretty incredible with a hip-hop vibe. I guess it opened in NY last August and while I’m bummed I didn’t listen to it until now, I’m really itching to get to a show now! Who’s going with me? Alright, back to food. 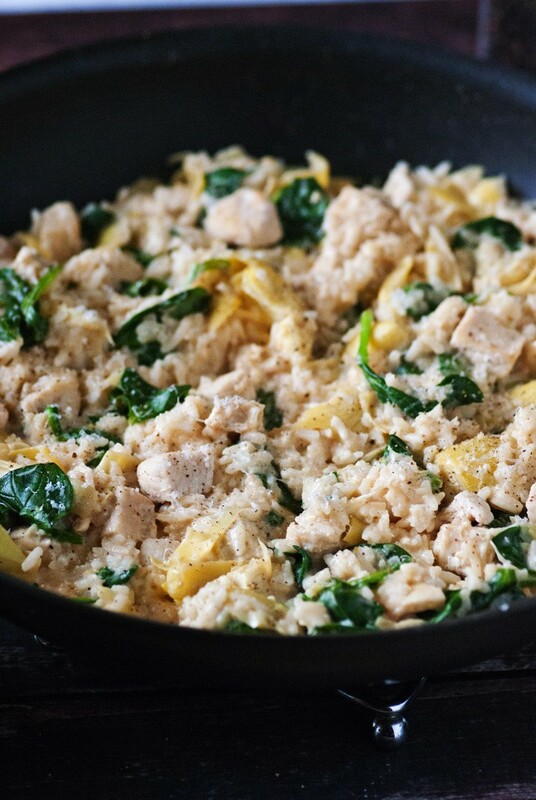 What did you think of last week’s one pan meal? Pretty incredible, right? Well hopefully you like today’s just as much. It has all the flavors of the ever-so-popular spinach artichoke dip but is wrapped up with chicken and rice to make a filling dinner. Like any good one pan dinner, it only takes ONE Pan! Imagine that :). You just brown the chicken, stir in the rest of the ingredients and cover and cook until the rice is tender. Just before serving you stir in the fresh baby spinach and a few dashes of hot sauce, if you’d like, and serve. Easy, peasy, and super duper delicious. 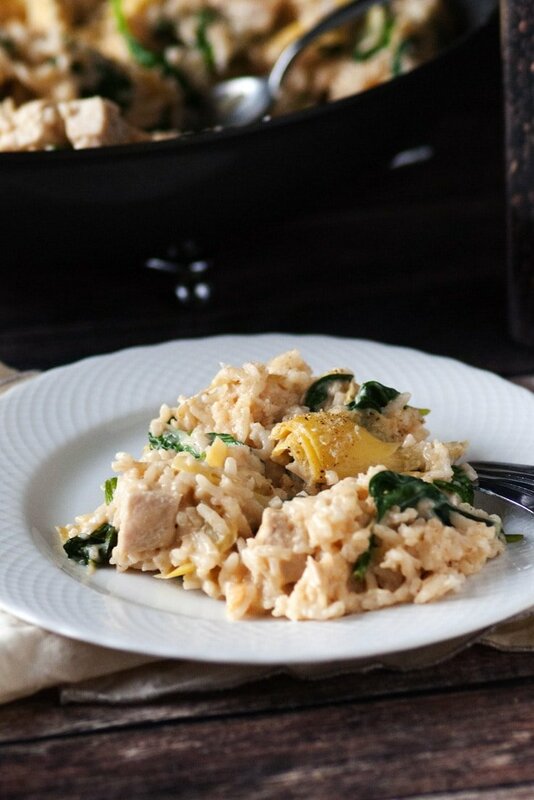 If you like the ever-so-delicious spinach artichoke dip, you're going to LOVE this One Pan Spinach Artichoke Chicken and Rice. All the flavor of the dip wrapped up in a filling dinner and made in a single pan! Heat olive oil in a large skillet over medium high heat. Place chicken in the skillet, season with salt and cook, stirring chicken until lightly browned-- about 4 minutes. 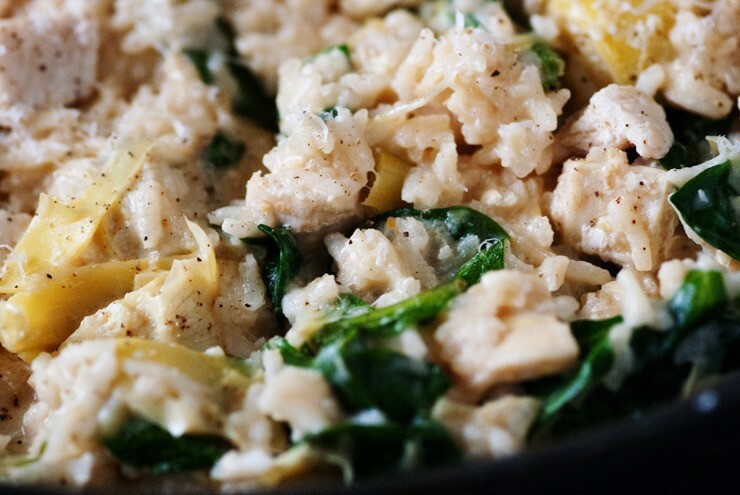 Stir artichoke hearts, rice, chicken broth and alfredo sauce into the chicken, bring to a simmer, cover and reduce heat to low. Cook for 15 minutes or until rice is tender. Remove pan from the heat and stir fresh spinach and hot sauce (if desired) into the rice. Cover pan and allow to rest for 5 minutes before serving. The fact that I can have a spinach and artichoke dip dish that makes up everything I need for a meal is AWESOME!! No longer do I have to feel guilty for craving it then eating chips and dip!! :) Looks great!